We’re really thrilled to announce the launch of our Android App. This is great news because people can now keep up with events on the go and do more with their smart devices. Using the app for the first time requires you to connect with your Facebook Account. This is great because we can recommend great events for you which are very personalised. Going to an event alone is sometimes really boring & takes a lot of the excitement away. Egotickets Mobile takes care of that for you by connecting you to events that your friends are attending and a lot more. We spent a great deal of time trying to come up with the perfect home screen that will be both appealing and makes sense to our users. The home screen shows the featured events in very large pictures and that takes about 60% of the devises screen. The rest of the screen has four simple action buttons leading users to various functionalities of the App. 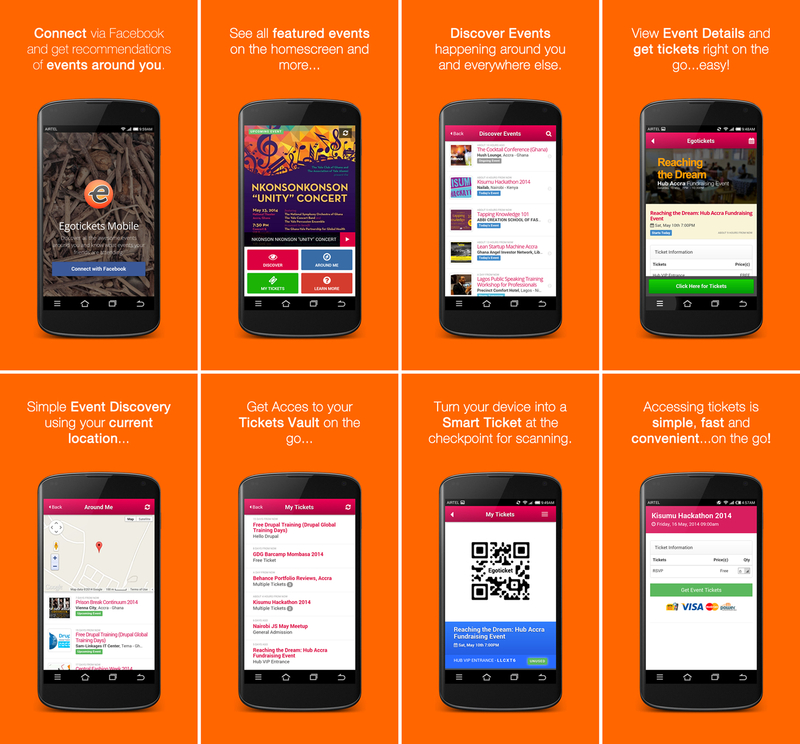 Checkout some of the screens from the Egotickets Android App. Filter events by country, category or search term. Discover Events happening around you, 20 mile radius from your current point using the GPS on your devise. Get Free or Paid Tickets directly from your device. We’re working on some upcoming exciting features to boost the experience. Go on Download The App and give us your comments and reviews.